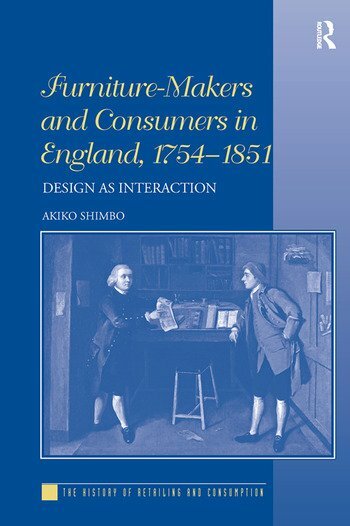 Covering the period from the publication of Thomas Chippendale's The Gentleman and Cabinet-Makers' Director (1754) to the Great Exhibition (1851), this book analyses the relationships between producer retailers and consumers of furniture and interior design, and explores what effect dialogues surrounding these transactions had on the standardisation of furniture production during this period. This was an era, before mass production, when domestic furniture was made both to order and from standard patterns and negotiations between producers and consumers formed a crucial part of the design and production process. This study narrows in on three main areas of this process: the role of pattern books and their readers; the construction of taste and style through negotiation; and daily interactions through showrooms and other services, to reveal the complexities of English material culture in a period of industrialisation. Contents: Introduction; Furniture design: sharing knowledge among craftspeople; Pattern books: communicating between producers and consumers; Forming taste and style: consumers' needs and participation; The showroom as mediator; Furniture repairs and services: building a clientele; Taste, state and the market: changing relationships between producers and consumers; Conclusion; Appendix; Bibliography; Index. Akiko Shimbo is Professor in the Department of Architecture and Environment Systems, School of Systems Engineering and Science, Shibaura Institute of Technology, Japan.